Parabolization of a 10" f/4 using star laps, etc. Ok....so as my frustrations mount on figuring my 10" f/4 I thought I'd go to the gurus here to help clear up a question that has bothered me since 1980. In regards to using full size star laps or petal laps or reduced area laps (ala Ellison) for general parabolization from a sphere..... they dont make sense to me. Since we want to increase action or 'abrasion' in the center compared to the 70% zone, we have more lap in contact with the glass in the center than at the 70% zone. That makes perfect sense to me. What doesn't make sense is that we also need to reduce the edge in comparison to the 70% zone, yet these laps all have more of the lap in contact with the 70% zone than the edge zones. Seems to me the 70% zone should get a minimum of work if we want to go from a sphere to a paraboloid. Im thinking of trying this type of lap since full size normal lap just wont let my edge come in, and even trying a 6" small lap has the edge lagging behind. Any ideas? Deepening the center and reducing the edge is the most economical way to parabolise. You can also start at the edge and continuously deepen everything inside it. Having said that you can reduce the edge with a star lap by polishing tot with the center of the polisher (ok Mark?) at or just inside the edge. That puts more action at the edge. Yep... "minimum removal" (aka Zernike correction) is one of infinitely many ways to adjust spherical... and not necessarily the best or most convergent/reliable. And, the way a lap interacts with the glass in often counter-intuitive. The local pressure, velocity, dwell, lap design, (and far more) combine to determine the global removal mapping. Add to that the "feel" of personal, hands-on figuring... and it STILL remains more of an art, than a science. We had all basic and advanced techniques at work and... still an art. Ion Figuring was (by far) the most deterministic. My recollection was that convergence was something like 3x-10x improvement per run. Imagine doing figuring runs (hand polishing), with each correction coming out three times better! Under those conditions, one single run usually finishes the part! I'm very interested in a star lap or star thin pitch under a spherical lap. Full size either way. I want to deform it from above, and polish by revolution. Calculating what force is needed where to deform it right is key. Deforming the lap to parabola is easy. I can do the math and even vary the star arm depth and width. What I don't know is how the increased speed of the outer circumfrance will affect removal rate there. I also don't know how pressure will affect pitch depth. I want to use very thin pitch so that depth does not change easily. And those optics tests look confusing. I plan to do a star test, and see if I'm getting closer by whether the blob star is getting tighter. No way can I do f4.25 otherwise. I'd get lost. And I know how to deform evenly and put calculated pressure in specific places. Just bend calculations and conical curve fitting with a few derivatives. Has my idea already been tried and failed? Why don't mirror makers make fast mirrors this way? Edited by stargazer193857, 08 November 2018 - 09:37 PM. A rotating lap would polish the edges faster, and maybe a bit unevenly, as it tips side to side. The center would catch up it through lap were kept balanced, but that is impossible to do. So, may plan is to polish the outside, not dig a hole. By the time I take a wave length off the outside, the inside will finally be smooth. Although, I also plan to use a spherical pitch lap random before I parabolize, first getting it to an extra smooth sphere. 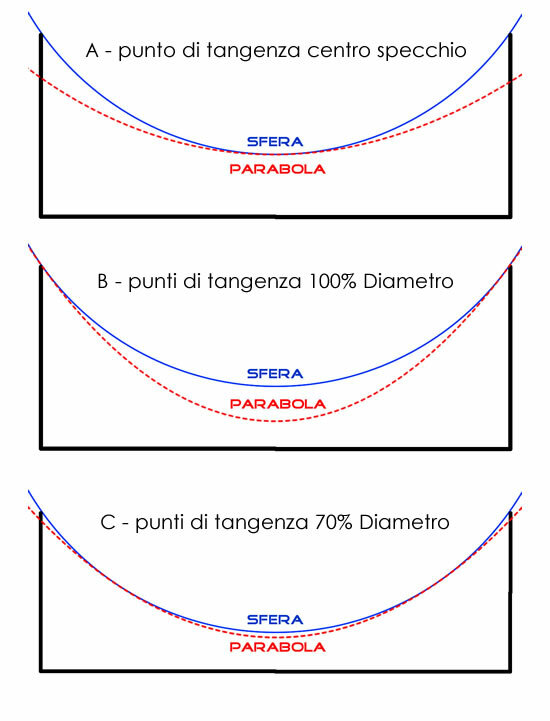 There are charts like the one attached that explain the 3 basic ways to go from a sphere to a paraboloid. Take it all off the edge, take it all out of the interior, or take it from the edge and the center. As mentioned above, the least amount of glass removal is the 3rd one shown. In my hands a star lap won't do that...the edge of the lap has little polishing/ removal power. In my hands, removing all the glass from the interior has worked for me. It involves more glass removal, but I can avoid turning the edge by keeping the lap action all inside with a sub or star lap. Get a sphere with a good edge...already an accomplishment for me, and then deepen everything except the very edge. Stargazer*** is suggesting a radical method that I don't immediately grasp. Let us know how it goes. On real big deep glass, Mackintosh mentions charging the parabolizing lap with fine abrasive...it removes glass faster, and it imbeds in the pitch so it doesn't grind. A semi-polish, semi-correction. Then paint a layer of pitch on, complete the polish, and do the final figure as usual. Maybe the use of polishing pads has superseded this method. I've used pads/polyethylene to get to 80% correction on deep glass. Edited by ccaissie, 08 November 2018 - 10:23 PM. Ive been doing a 6" sub diameter lap, W stroke, TOT of course, with 1" overhang at the edges, cerium oxide. I do about 10 minutes at a time. I'll keep trying that and see what happens. Really dont want to make a full size star lap but if I gotta, then I gotta. Edited by totvos, 08 November 2018 - 10:42 PM. Thank you for the pictures. I agree the third one removes less glass. Tempting. Finer polish could be started with. But I don't know how I would approach it. My plan likely works best on the first one. Yes I saw this, in fact, it is what made me start this thread. I'll try this if several more sessions with the 6" sub diameter lap do not work. Thanks. Hi, stargazer! Well... yes, most of that has been done an put into practice. Even laps that adaptively compensate as they are spinning and translating all over the work. Actually, the math part is the EASY part. Thing is... laps still don't obey our theories... because the way polishing (removal) actually occurs is FAR more complex than the modeling. -Deforming the lap to a parabola is not easy...I have no idea how you would do that. -The outer edge of a spinning tool always has higher action. -The tests are not confusing..I have used them since I was 14. Working with them helps you understand what you're doing. Maybe a star test is workable for you. Best to combine it with another...Most folks at least use Ronchi. Works when there's no stars... you're building a scope...a tester is way easier. -You'll want to use standard thickness pitch. And standard techniques. It has to give a little bit to conform and smooth the glass. You seem to think you can mechanically create a perfect tool, and then have it shape the glass into a paraboloid. That's not how it works..unless you're making a shaving mirror. -I know it's fun to operate out of the box and try something different, but you might first want to try some of the techniques and guidelines that have been used since Newton. -Mirror makers don't use that method to make fast mirrors because the standard methods work, and your idea just doesn't seem feasible, if I am understanding what you're saying.. I know some people will bark at me for discounting Stargazer*** ideas. What are the odds his method will work? Hey, try it. I ran this in polsim, the polishing simulator program. It seems to show that a straight stroke just 25mm off center and 175mm long does the job. I'm sure the W helps blend the action, a feature that you can't plug in with polsim. Pretty sure that a 6 sub lap will do what you want. Yes, indeed. We had done deformation experiments decades ago (using a dense matrix of force actuators on a nice thin disc optical flat and instant feedback with an interferometer) As one would expect, pure cylinder (what we call astigmatism around here) is frighteningly EASY to induce. Pushing anywhere, in any direction... the 1st thing to rear its ugly head is ASTIGMATISM. On the other hand, Zernike Spherical is extraordinarily Difficult to tune in. And, the reason is blatantly Clear, once one is trying to actually Do it. The (radially-quartic) Zernike Primary Spherical Term (aka parabolizing differential) requires a LOT of stressing potential energy. Translates into you gota push HARD, and in all the right spots. Even slight errors in that create... Astigmatism. I tried Mel's star lap software on my 6" F8 when it was near spherical. It worked surprisingly well - full size lap. You only need to do a 1/3 stroke rather than long wide W strokes. Sounds like people are pushing wrong. You need to push with circumfrantial rings at least an inch deep so they don't flex, and they must have padding between them and the tool so you don't just get 3 points of contact. A cantilever diameter strip can push on one ring and pull on the other via it's flection, which can be dialed in. Glue may be needed. And the twisting should come from a central axel so less uneven force applies to the outer edges vs turning from there. Velocity might matter in addition to surface area. That can be tested. Once an area grinds, the grit there might push further into the pitch. Applying force might compress pitch differently in areas vs areas with less force, defeating the force it curve. A star test can be done with a Christmas's ornament 200 feet away at sun rise. Even with thermals, info can be gleaned early on before precision is needed. True that other techniques have worked since Newton. But technology advances, and many newbies on there struggle with thick f6. Will try this tomorrow! Thanks!! Well, I now agree standard thickness pitch will transmit pressure where I want, and also take the curvature of what it touches for a smoother curve. Whereas a subdiametee tool can dig a hole going over the same place mutiple times, a full size star lap might not dig the center since it might be propped up by extremities. Edited by stargazer193857, 10 November 2018 - 12:13 AM. If you buy a big bag of plaster, don't waste it; make many experimental tools with it and see what they do. You've never even made a mirror and you somehow know more than experienced mirror-makers? I don't know. Just newbie enthusiasm and guesswork, which in my case has proven wrong time and again in other hobbies. I should have said "differently than how I would", but now it is too late for me to edit my post. I'm probably wrong, but I definitely want to try. Plate glass is cheap. The possibility of finding a short cut is just too enticing. I guess when I read phases like actuator and push in the right place the right way, I assumed that meant to rings were used, and that my idea had not yet been tried, and that my idea then might work. Claiming other methods are wrong sounds like saying a right way is known. I don't know of a right way. I just know of a way I really want to try, now that it seems confirmed it has not yet been tried. What is very possible is that deforming a tool to polish image A will just get me as close as image C in places. The force to deform the tool may also be large compared to the weight of the tool, where that weight is needed to do the polishing. Standard methods dodge those issues.